I’ve never really been the type to enjoy walking around churches despite being in total awe of so many things about them. I was mesmerised by the Il Duomo di Firenze in Florence purely because of its size and history, and we all know how impressive the La Sagrada Familia is in Barcelona is. But I’ve never really loved walking around them for any longer than say… oh 20 minutes maybe? So imagine my surprise when on my recent Cyprus holiday I came across some of the The Prettiest Churches in Protaras. This also explains why I wasn’t too excited about the fact that I’d repeatadly read how pretty the churches in Cyprus are before I left for my holiday, and didn’t make any plans to visit them whatsoever. Despite the lovely Becca having a lovely blog post on the one she visited, I just wanted something a little more exciting… and different. So imagine my surprise when one day, when my brother and I were aimlessly driving around, I recognised Profitis Ilias from Becca’s photos perched on its little rocky hill, and I had a sudden feeling that I just had to go see it. Looking all pretty and welcoming, we hiked up and I quickly realised what a good choice we’d made…despite it being nearly 40 degrees at the time. Soz bro! Situated just on the outskirts of Protaras, behind a main road that rises above the town with panoramic views making it a perfect stop at sunrise or sunset. It was only around a 10-minute drive away from our villa and it was super easy to find once we stuck its name in the satnav. There’s also a little cafe at the bottom, plus parking is free. Bonus. I have no idea how many steps there are as every time I tried to count them my brother started chatting to me, so I gave up. But I’m not very fit at all right now, and I was up in around 10 minutes. So, no biggie and the steps are far easier than you think they’re going to be. My first impression was that it looked surprisingly new and clean looking. The bricks were symmetrical, the lines perfectly aligned and that’s because it was actually only built in 1984, in the place of an older chapel. Built using stones from the area, this explains why it fits in perfectly with its surroundings. From the very first step, and all the way to the top, you’ll see brightly coloured ribbons tied around the trees and bushes. Some say you can do this to make a wish, but mostly I think they were there from people making prayers and as a remembrance symbol. Either way, they are a very colourful and happy. I loved spotted them as I walked up and stopped a few times to read peoples kind words and wishes. Very poignant, very honest and very real. An atmosphere filled with special thoughts and memories. We went back a few days later with my Mum when it was a gorgeous clear day, the sun was setting, and we admired the views for miles. The second church we found couldn’t have been more different. Old, totally secluded, hidden away, shrouded in mystery and different to anything else I’d seen before. We took the car down a bumpy dirt track wondering if we were heading the right way when we spotted a little sign and a faint blue wooden door against a whitewashed wall in the distance. Apparently only certain locals even know about the existence of this place. Built into the rocks this quaint, old but unique church is slightly eerie when you first step inside but your eyes quickly adjust and then all of a sudden, nothing but peace and calm exists. Even if you’re not religious you’ll struggle to not feel how we did. They’ve used an old cavern in the mountain to create a very calm, and unique place of worship. Locals have lit small twinkling candles and photos of loved ones are dotted around. There’s no windows, just crevices where the bright sunlight seeps through. The juxtaposition that something so unknown and secluded can be situated so close to one of the biggest party towns in Europe blew my mind! It felt worlds away from anything else on the island. I didn’t take too many photos as it seemed a little disrespectful and like I maybe shouldn’t have been there. I felt like I was almost intruding on something that meant a great deal to the people that visit here daily. Still, we admired its charm, whilst all, for once, completely silent. No chatter, no oohs’ or aahh’s… not even from my chatterbox niece. We quietly closed the door behind us, put the latch back on and sat on the steps for a few minutes in the boiling hot sun. 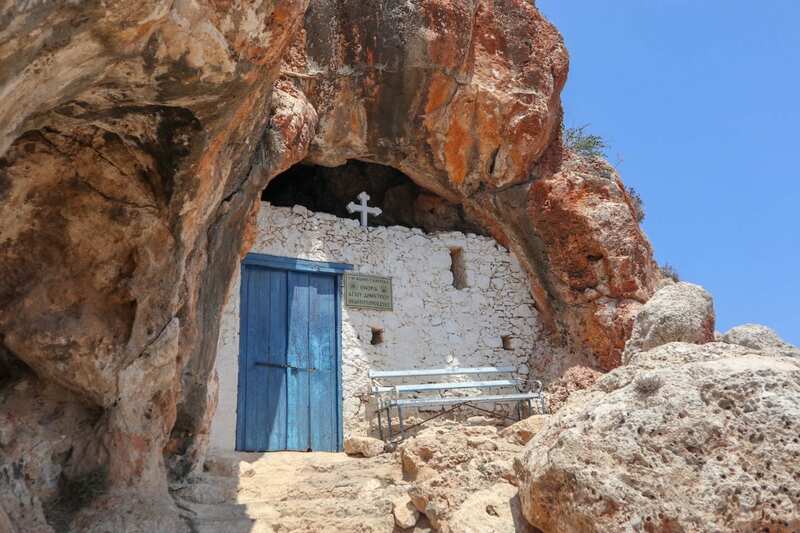 You can find the unusual cave church here on this map if you end up being lucky enough to go. If you’re visiting Protaras both these churches are absolutely worth the visit. They’re unique, special, and offer an insight on how the local people of Protaras feel about religion and how they preserve the memories of their loved ones. It’s pretty special and I can’t imagine I’ll see any other churches like these anywhere else. There’s plenty more pretty churches dotted around the island, and I’m sure you could make a fun day out visiting as many as you could possibly could find. Just make sure you choose a good one for sunset too. It’ll be worth it. "(AD) The Coolest place to Get The Best Snacks in Soho, London"
"Wedding Cupcakes at The Elvetham"